Brief Synopsis – After seven men escape from a Nazi Concentration Camp, they must each find a way to survive on the outside without getting caught or killed. My Take on it – This is a film that I saw years ago and recalled enjoying it, but besides the overall premise, I didn’t remember much about it. This is a film that does a nice job showing how the Nazi’s chose to first deal with the problems of people in their own society before they began their conquest of the rest of Europe. In retrospect, this film feels a bit too tame in the way that they show how the Germans dealt with their enemies, but for the time it was made, it must have been shocking enough. 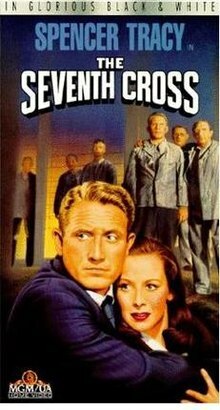 Spencer Tracy is great in the lead role and he manages to give a powerful yet subtle performance which works to show the reasons how and why his character keeps averting getting caught by the enemy. The supporting cast is also great and the standouts are husband and wife acting team Hume Cronyn and Jessica Tandy (who also play a married couple here). Cronyn was nominated for an Oscar for Best Supporting Actor for his performance here which resonates so well. This movie has an on-going theme about the goodness of man and how even small gestures of help can eventually snowball into doing something on a very high level of importance. The story is quite poignant in the manner that it depicts things along the way. Bottom Line – Nice depiction of the way that the Nazi’s dealt with native Germans before they started on the rest of Europe. The story feels a bit tame based on what we know now, yet at the time, it probably was quite shocking. Tracy is a perfectly subtle in the lead which works quite well. The supporting cast is also great with Tandy and Cronyn standing out among them all. Cronyn was nominated for an Oscar for Best Supporting Actor for his role. The theme about the goodness of man and that even small gestures of help can snowball into a much larger form of assistance comes across very poignantly the whole way through. Recommended!